I am on a knitting roll. I finished not one, but TWO projects this week. I’m shocked. The first is a pair of socks that I started in April. The second is a gift, so y’all don’t get to see it until the thing gets mailed to the US. Anyways, I’ve had this skein of bright pink/orange/red yarn for about a year now and I figured it was about time to do something with it. I feel all good inside when I make a dent in my yarn stash, you know? The Vanilla Latte socks are super simple, which is what I was looking for. After the tadpole socks, I wanted something a little mindless to knit. And voila! I feel like the color makes up for the relatively plain pattern, don’t you? I’m still on a knitting roll. 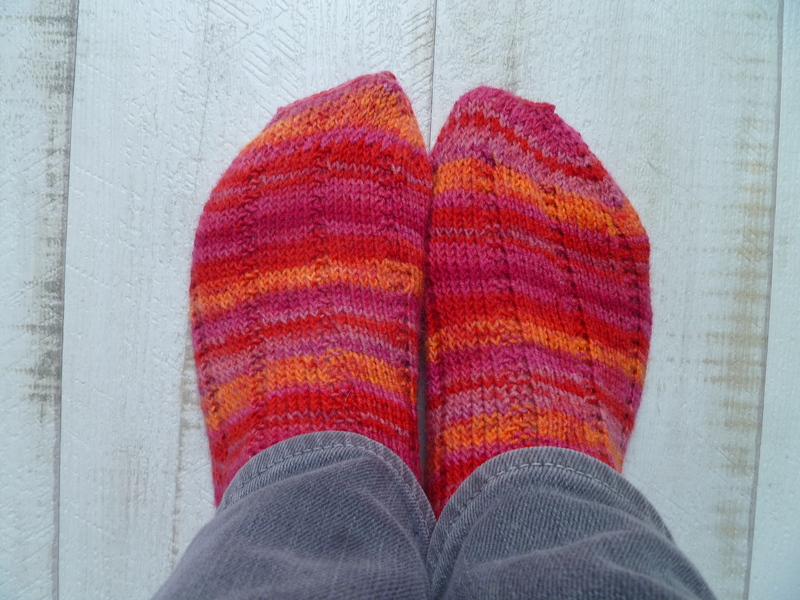 I managed to finish a pair of socks in under a month (one sock in a week!) due to the March vacation. This time around I tried this tadpole pattern off Ravelry. It’s a fairly simple pattern to memorize and I like how you only work the pattern on two sides, not all four. 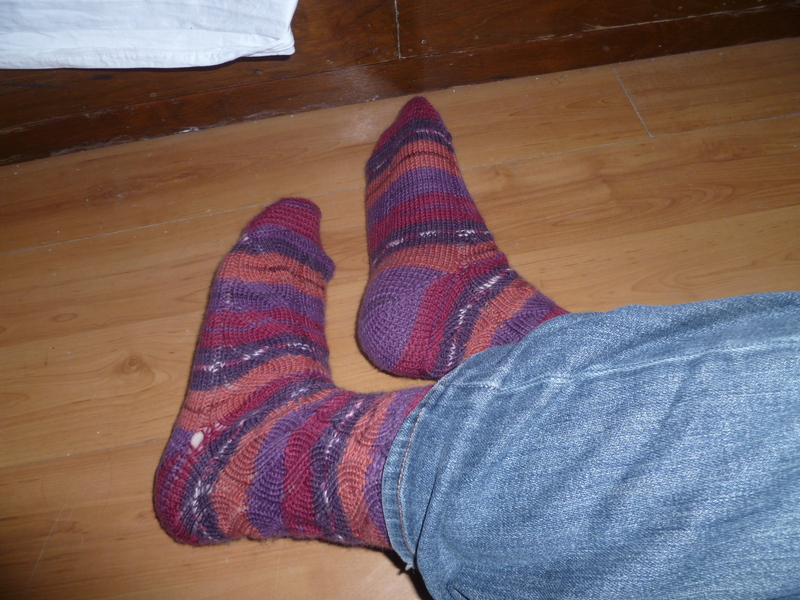 I recently finished another knitting project with some yarn that I bought in Newcastle, way back in November. It’s a lovely Rowan Tweed Aran in a cool turquoise/blue/purple colorway. (Nidd 781, for those who are curious.) I still miss my brown rasta hat, which I lost in Chengdu last winter, so I figured I should try to make something similar. The gods of Ravelry suggested this pattern by Amy Thiessen. Yes, it’s a replica of some hat that Kristen Stewart wore in one of the Twilight movies, but I liked the slouchiness. Let it slide, people. 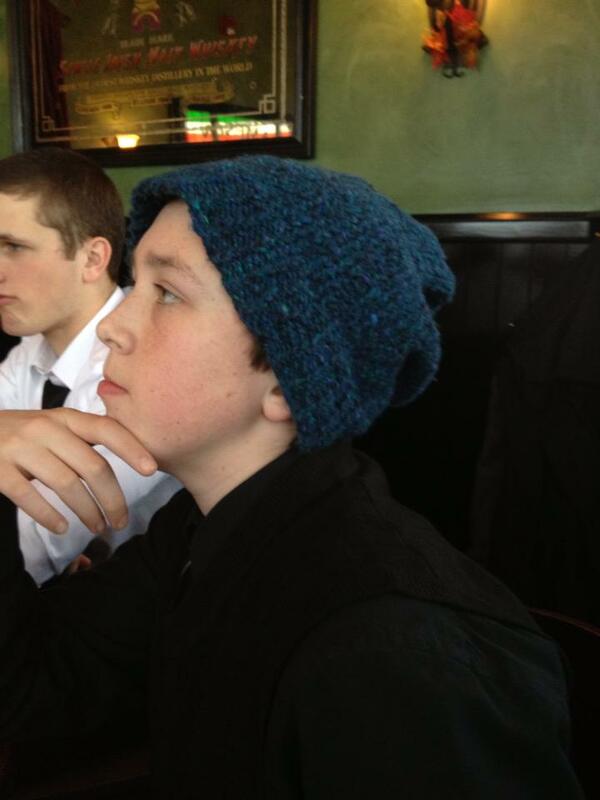 My hipster hat, as modeled by my cousin Kevin. In retrospect, I should have made the band a little tighter and stopped at 35 rows instead of going to 40 before the decrease. Since the tweed is a little heavy, the hat has a bad habit of sliding off when I’m not careful or I don’t bobby-pin it in place. I love it though. It’s so warm and I like how I can hide 95% of my frizz on a bad hair day. I’d definitely recommend this pattern. Surprisingly, I’ve kept up my knitting despite all the fascinating things going on in my life. Well, it’s not that surprising: I didn’t have regular internet access in my room for a long time, so I usually ended up listening to Radiolab podcasts and knitting at night. 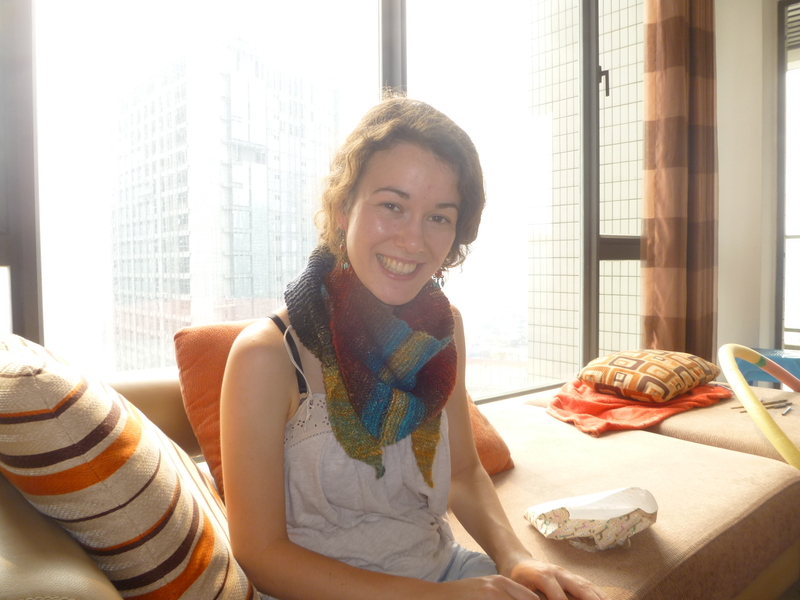 After two months, I finally finished my project: a nice blue scarf. I’d like to say I’m above petty things like picking a pattern because of the name, but I’d be lying. The Voltaire scarf is a reference to Zadig and Voltaire, the French clothing line, and not the satirist. I don’t mind. It’s a fairly simple pattern and it’s got a really cool texture on both sides. 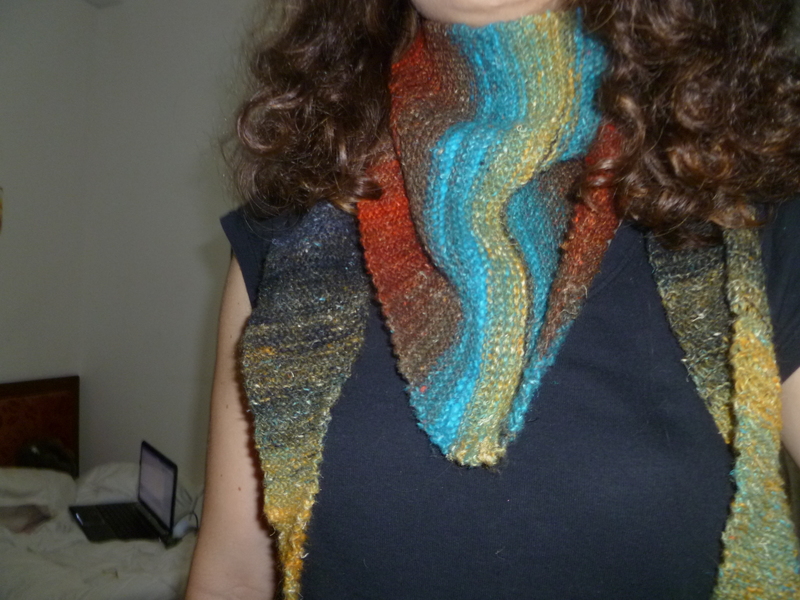 I decided against turning it into a cowl of some kind – that’s my next project. I’m glad I finally finished the dang thing – Paris has gotten cold in the past week. My current knitting best is finishing a pair of socks in under three weeks. No, the Apocalypse is not nigh. Mostly, it just means that I get hella productive in other endeavors when I don’t have the internet at my disposal 24-7. For two weeks, depressed because of my move to a new dorm and annoyed at my lack of internet, I watched lots of movies and knit. And knit and knit and knit and I had gotten to the saturation point where I was dreaming of knitting. I also managed to burn through all of Planet Earth, three seasons of Supernatural, and a couple of forgettable movies. The end result? This. This is the Nutkin pattern, made by Beth LaPensee. I rather like it. It’s simple. Easy to follow, simple to memorize, practically idiot-proof, and it looks super impressive. It’s not lacy, despite the yarn-overs, and a top-down sock, which I prefer. I used Meilenweit Merino Lana Grosa (2143), which I got from the lovely ladies at the Knitting Cove in Port Jefferson when I was home for Christmas. I think I’m going to leave the sock knitting alone for now. It’s been my default project for the past six months, and I’ve worn my poor DPNs to shreds. 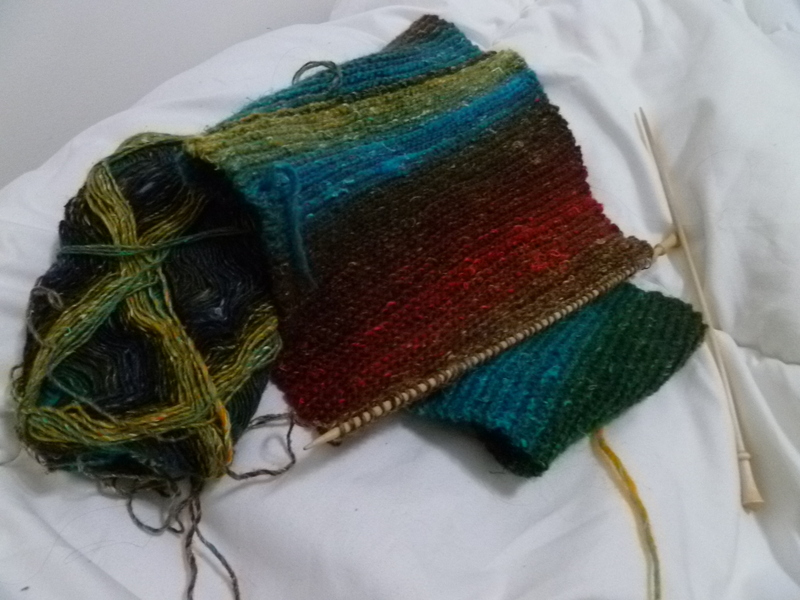 Right now, I’m working on a nice, simple baktus scarf and using my Noro Silk Garden yarn. I think there’s a little too much wool in the yarn to make them into socks, anyways. And then there’s the lovely silk yarn that I picked up in Sydney at the Rocks Street Fair last January. It might become a shawl, or maybe a scarf or two. Not that I need any more scarves, but it would make a pretty gift. 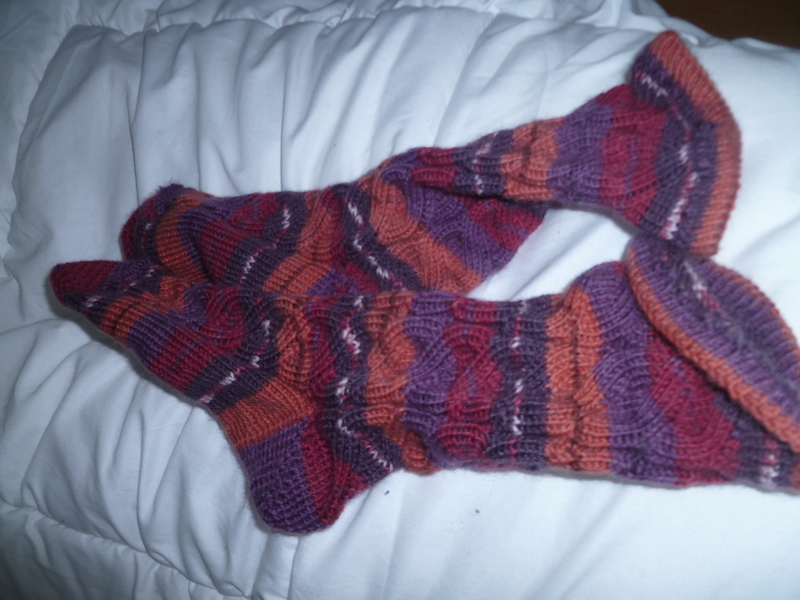 As for these socks, they’ve been bundled up and sent off to a friend. Hope you enjoy the socks, Sophie!